At the Ferry Plaza Farmers Market, you’ll find everything you need for a local, sustainable Thanksgiving. To inspire your menus, here are some resources and seasonal recipes from our farmers and some of the chefs who shop at the market. Please join us in giving thanks to the hard-working farmers, farmworkers, and food artisans who make this bounty possible for the holidays and throughout the year. Happy Thanksgiving! Our usual Thursday market farms and vendors will be at the Wednesday market, along with a few special appearances, including pies from Three Babes Bakeshop. Learn more. Use our Veggie Valet, a free service that allows you to drop off your farmers market purchases and either continue shopping or grab your car for curbside pickup. The Veggie Valet is open until 1 pm. Check in at the Information Booth. What if renowned chefs Alice Waters, Annie Somerville, Joyce Goldstein, and Craig Stoll were coming to cook your Thanksgiving dinner? We’ve got the next best thing. 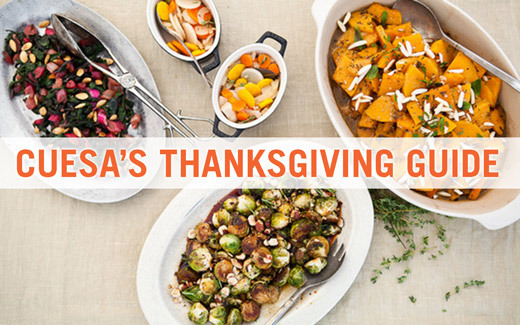 CUESA and Good Eggs are teaming up to bring the talents of the best local chefs to your Thanksgiving table. 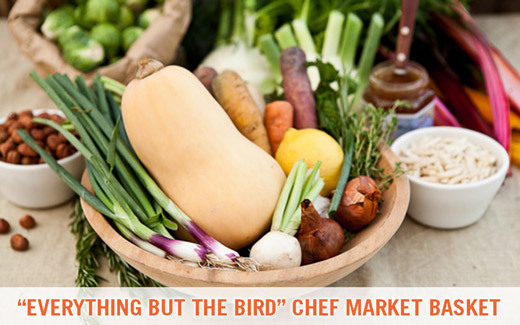 Introducing the “Everything but the Bird” Chef Market Basket, a Thanksgiving kit complete with four delicious side dish recipes and all the ingredients, fresh from the Ferry Plaza Farmers Market. The easy-to-follow recipes promise foolproof results in your kitchen. This Thanksgiving, serve a succulent, antibiotic-free, humanely raised bird (or vegetarian alternative) from a Ferry Plaza Farmers Market purveyor. 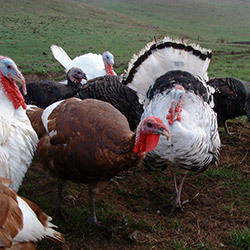 Read last year’s article about heritage and pasture-raised turkeys at the market. Marin Sun Farms offering a limited number of pasture-raised heritage and Broad-Breasted Bronze turkeys, turkey stock, and ham, all from their network of local farms. You may reserve through their website and pick up from the Ferry Plaza Farmers Market on November 17. For questions, contact Mike by phone at 415.663.8997 x106 or email. Mountain Ranch Organically Grown has a limited number of organic heritage turkeys and quarts of turkey stock. Buy your bird early or pre-order at their stand at the Saturday market, or contact Norman Gunsell by phone at 209.754.5253 or email. The Gunsells raise all their birds themselves on pasture with certified organic feed. Read more about their turkeys. 4505 Meats’s famous turducken is back by popular demand in grand and junior sizes. They also have heritage breed smoked turkeys, smoked pork rillettes, and other Thanksgiving treats. Order online. Overstuffed oven? Tight on time? Craving creativity? 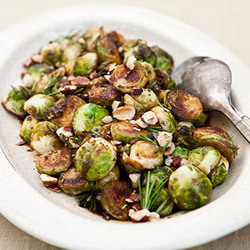 Check out these seasonally inspired offerings from the CUESA recipe archive. *Included in the “Everything but the Bird” Chef Market Basket. 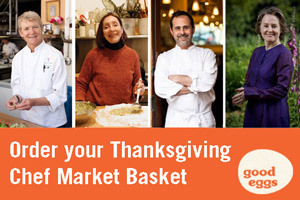 CUESA’s Thanksgiving Guide and Chef Market Basket photos by Kimberley Hasselbrink/Good Eggs. Turkey photos fom Marin Sun Farms.